If you liked my Ramadan Activity Book for Little Kids, you'll also like this Hajj Activity Book for Little Kids inshaAllah. 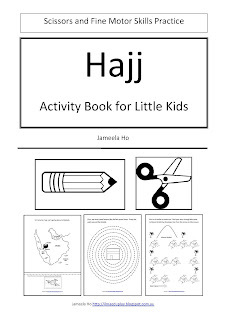 It's very similar to the Ramadan book as it contains practice pages for fine motor control including pencil and scissor skills but with a Hajj theme. Fine motor control is very important for your young child to develop as it prepares him for writing, drawing, tying, opening - any type of manipulation that requires using the fingers. As he gets older, if your child has not developed this skill yet, he will try to avoid these activities. This will lead to low self-esteem as he won't be able to control his handwriting. When your child goes to school, he will need to have good control of his fine motors otherwise he'll be left behind. The ability to form letters and numbers, that is to write, is usually the last for children to develop. Your child will have memorised numbers, letters and sounds and he will be able to count and read well before he will be able to write. Make the task easier for him by giving him lots and lots of fine motor control practice. Download this free Hajj Transportation Theme Activity Pack. Do some Hajj Activities for Young Children. Make some hajj themed melt beads. Make some more hajj themed crafts. To receive more free printables, please subscribe below to my education newsletter. Wa alaykum salam. I've been posting weekly so do come back. Just bookmarked it, inshaa Allah its great resource to have. Yes, inshaAllah, it'll be good for them to have something to do and learn about hajj. Assalamu alaikom sister. I find your blog very helpful. I don't have children and I'm not living with any child for I'm currently living independently for studies. In shaa Allah in the near future, your blog is still active so I would be able to use your freebies. In shaa Allah. InshaAllah sister, do come back. InshaAllah I'll have even more resources available by then. Mashallah!! A very lovely, beneficial Idea, I would say..
Mashallah, it s lovely. Do You mind if I translate it in french and use it for my children? No, I don't mind as long as you don't distribute it to others. If you like, you can pass me the translation and I can type it up and make it available for everyone. If you put your name I will write your name as the person who translated it. JazakAllah khayran dear sis, may Allah swt reward you for your efforts. 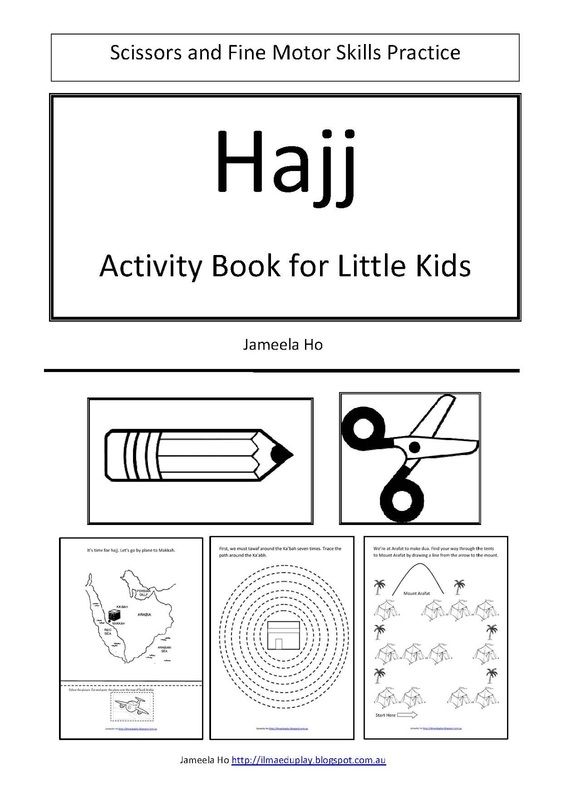 InshaAllah will be using your Hajj activity book, my kids are 5 and 3 years old, this is mashaAllah perfect for their age group. Thank you, sis!! Wa iyaki. Ameen. Yes they're the perfect age. Hope they enjoy it. You're welcome. Super great idea! Going for Hajj in two weeks inshaAllah, so planning to leave my kids doing this as a way to help them relate. I've added you in my dua list! Jazakillahu khairan! WA alaykum salam. May Allah accept your hajj and please do make dua for me. Jazakillahu khayran.